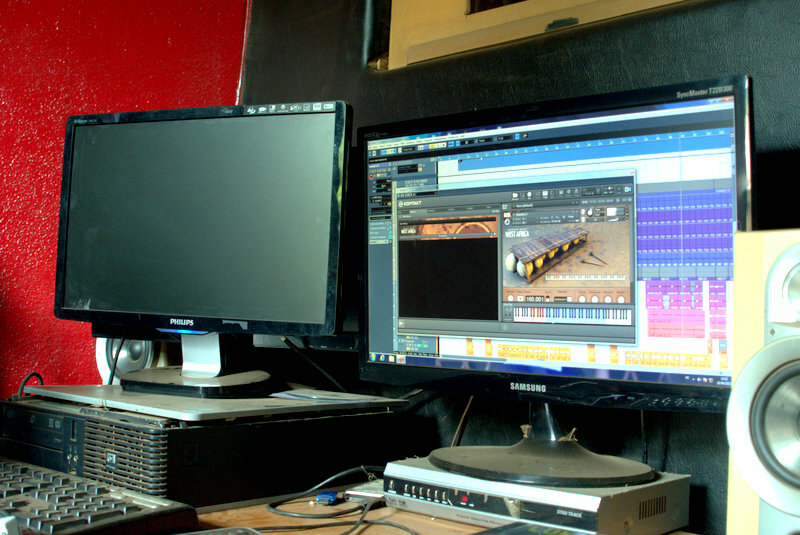 “Luka Productions” is based in a small studio off a busy street in the capital of Bamako. The mural on the outside of the building, with giant microphone and curling graffiti letters is arguably larger than the four walls inside. A repurposed boutique, there are two small couches framing the the computer and console of studio engineer, rapper, and producer Luka Guindo. His portrait hangs over the computer. Behind plexiglass is a closet sized sound booth. 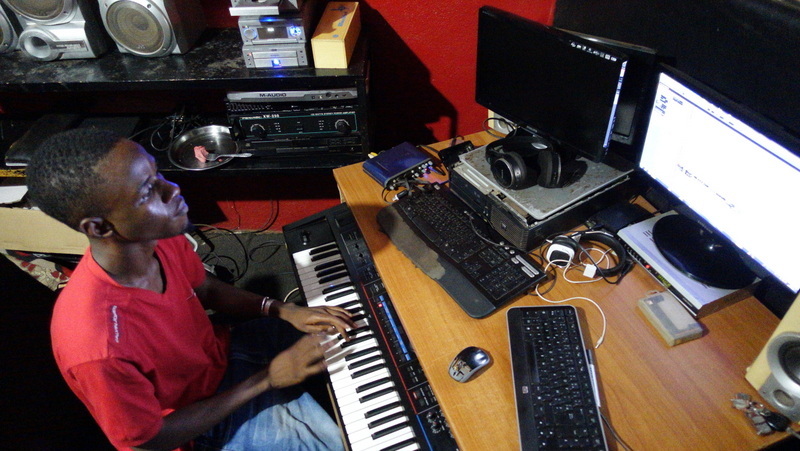 Luka, responsible for the Supreme Talent Show album and hundreds of other tracks, is self taught and PC based (cubase, reason, and fruityloops) – one of many producers/studio owners that create all the hip hop produced in Bamako, and by default Mali (there are smaller Hip Hop studios scattered throughout country, and at least one distinctive Hip Hop style in Gao). Every composer has singular style. Luka relies on melodies – he plays piano in the local church – that mimic the vocals, complementing one another. The drums are heavy and punchy, and pitch bended keys solo over the distinctive and improvisational rhythms. He often adds cut up djembe and balafon to the mix to give a local touch, which are sampled though not in the studio, but packaged in a Native Instruments plugin (the website seems aimed at Western audiences, unbeknownst that their product is probably used more in West Africa). If there are doubts to the authenticity of the production, Luka includes a drop at the beginning and end of every track. Luka is quiet when working and rarely looks up. His eyes are glued to his computer, and his hands fly over the keyboard with a series of shortcuts, deftly cutting and loudly slamming the keyboard to drop in segments of a track. 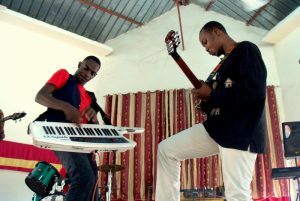 Ticking off the metronome, he adds to a production layer by layer, before improvising a melody. The vocalist steps into the booth minutes later, and the track is recorded. At the end, he does a quick master – these are not tracks for high end stereos or audiophiles. Most, if not all of the listening will be on cellphones, USB radios, car stereos, and youtube. 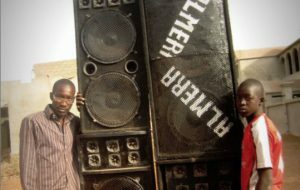 Hip Hop is the most popular youth music in Mali. 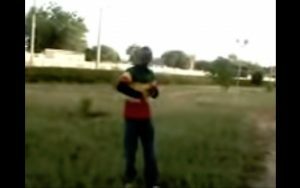 Songs circulate via the new media distribution of mp3s and usb keys, but are also posted online – the two biggest curators of Mali Hip Hop are websites and youtube channels – RHHM and Bamada-city – both based in France and run by Malian expats. With open distribution channels and the low cost to record tracks, the music is uncensored by either institution or government. Last year, battle raps and clashes became so prominent that the government attempted to intervene, as lyrics were insulting parents of other rappers, including some prominent social figures. While some producers align themselves with rappers, in doing so, they’ve been caught up in the feuds. Luka has tried not to get involved – he wont let people record “clash” vocals. Luka’s studio is DIY and cobbled together with what is at hand. Much of the equipment has made the journey here from the US or Europe via traveling friends and family. For professional engineers in Mali, it’s not the best, and there a few high end studios in Bamako. But Luka makes up for this with talent and speed. He can dash out a song in minutes. The better studios are too expensive. Unused and inaccessible, they gather dust – and their engineers rarely get a chance to record. Will you be releasing an album of his work on sahelsounds? Would love to hear more, especially collabs with Salazar. This is fantastic work!